Bleed Eagles Green: Philadelphia Eagles Blog: The Return of "For Who, For What"
The Return of "For Who, For What"
"For who, for what?" Ricky Watters may have coined the phrase, but I am thinking Dan Klecko might want to adopt it as his own. Cut-downs are fast approaching for NFL teams. And like all teams the Eagles have some difficult decisions to make. One area that has some intrigue is along the defensive line. More specifically who gets the final spot on the DL? I see Patterson, Bunkley, Abiamiri, Laws, Clemons, Smith, Parker, Howard, and Cole making the final cut. That leaves Jason Babin and Dan Klecko fighting for the last spot. So a season after moving to FB for the good of the team Klecko may soon find himself out of a job. Prior to becoming the teams' full-time FB last season Klecko was off to an impressive start, notching 2 QB sacks in the seasons first 4 games. But any future padding of the stats was lost when Klecko moved to the offensive side of the ball. Fast forward to the 2009 season and Klecko is back to playing defense. Unfortunately for Klecko the Eagles took a chance on cast-off Jason Babin this off-season. When Babin was first signed it looked like nothing more than an extra body for camp. 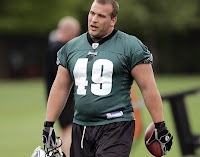 The Eagles would be Babin's fourth team in his short 6 year career. A former first rounder that never delivered first round results. But a funny thing happened this preseason...Babin actually began playing like a 1st rounder. In 3 preseason game Babin has notched 2 QB sacks and several more QB hurries. These are numbers that earn you a roster spot. So with Babin excelling Klecko looks to be the odd man out. Sure Babin is a DE and Klecko is a DT, but the ability of both Howard and Abiamiri to play the DT position on passing downs limits the number of true DTs the Eagles need to keep on their roster. Laws should be able to spill both Patterson and Bunkley when necessary. So in the end putting the team ahead of himself might end up screwing Klecko. For who, for what indeed!